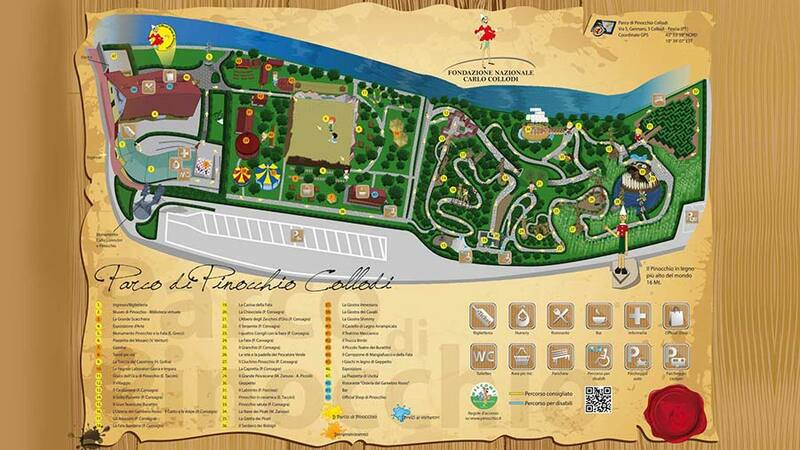 The park of Pinocchio is in the nearby of Collodi's Garden from where you cross the river Pescia and on the left there is the entrance of the famous Toyland . It has been built between 1956 and 1987. To get in the Park of Pinocchio is as living a fairy tale. In 1956 was inaugurated the bronze work, five meters high, symbolising the growth of Pinocchio from a puppet top a boy. In the small square , dated back to the same period, there are mosaics telling the main episodes of the imaginary adventures of the puppet. To the south of the park in 1972 Toyalnd was built. A small gallery introduces to the Village of Pinocchio from where a stone path starts peopled by the statues representing the characters of the novel .Once visited the park following the fable , you reach the Laboratory of words and figures , a place where time by time are organised exhibitions of the pictures done by the students for Pinocchio's birthday. The Park of Pinocchio is a pleasant stop for grown ups and children.